Words by Kevin Doocey on June 5, 2014 . With the ever-fascinating World Cup approaching in just over a fortnight, we here at Tyne Time headquarters thought that our readers deserve a little prize in order to equip them for the upcoming tournament. Quite a number of Newcastle United players will make the trek to Brazil to compete for their nations and with that in mind, it is fair to say that Magpies’ eyes will be firmly fixed on Rio when things kick off on June 12th. As many of you will know from reading the site on a consistent basis, we love to give back to readers whether it be digital cameras, magazine subscriptions, football jerseys, or indeed hard, old fashioned cash like we sent to our Fantasy League winner from Uganda. 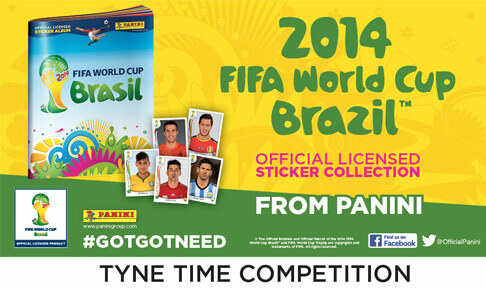 This time, we have teamed up with Panini to offer not one but three lucky readers the opportunity to mark their World Cup in style with a ton of free Official 2014 FIFA World Cup™ Stickers. Thanks to the lovely folk over at Panini who offer the prestigious 2014 FIFA World Cup™ Sticker Collection they have sent us 3 great prizes for our lovely readers. Founded in 1961, Panini provide memorable collectibles with almost every football loving fans having tried their hand at completing a World Cup/European Championship album at some stage of their life - don’t lie , you’re probably looking for that elusive sticker from Italia ‘90! So, what are the prizes, and how I can enter you say? There are a total of three prizes in their giveaway, the winner will receive a priceless 60 packs of stickers (total 300 stickers) - a prize which you won’t find many other blogs handing out, I can assure you of that. Second place will receive a starter pack - an album, and 35 packs of stickers in order to get their collection up and running, or indeed help compliment their existing FIFA World Cup™ Sticker Collection. The competition is completely free to enter and the winners will be chosen randomly, providing you supply the correct answer to the question below of course! So here’s what you need to know: entries close on Saturday (7th) at 20.14pm (UK time) and the question? Which Newcastle United player will face Argentina in the group stages of the World Cup? P.S: The form will not tell you that your entry as been recorded, but filling all the correct forms, and clicking ‘Submit’ once will guarantee your entry. Send all entries using the form provided below, and again thanks to Panini for kindly providing the memorabilia. Check out their site to see their vast range of enticing collectibles. As ever, best of luck with your entry!